Grab your coat, run out the door, and get to the Nevada Museum of Art right away. 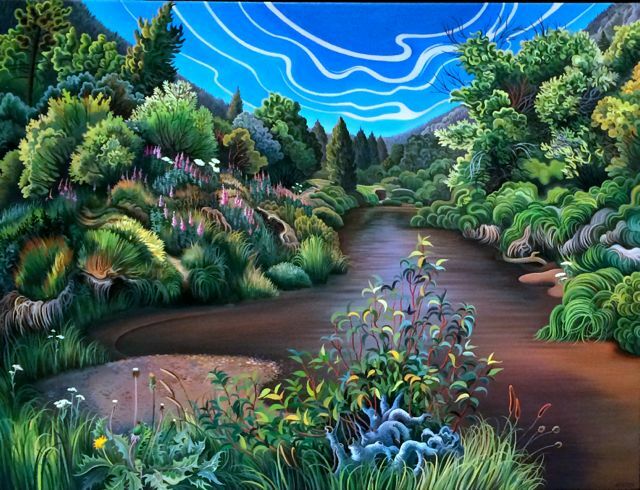 The Truckee River is one of the landscapes featured in the captivating art of Phillis Shafer. She reminds us of nature’s – indeed the river’s – beauty in this exhibition “I only went out for a walk …”. She says on her website, “My method is to paint directly from the natural environment. …” She has some thumbnails of her work on her website. See her paintings live through May 11, 2014. It is more than worth the trip to the Museum. This entry was posted in Keep it flowing on February 17, 2014 by Dennis Ghiglieri. A beautiful exhibit! The artist has a enchanting way of showing the life of trees, plants, water, and, especially the sky and clouds. Thanks for the tip. Another great way of showcasing the beauty of the Truckee! Kudos to the artist and the museum for creating and displaying this work – heightening the awareness of important landscapes within additional audiences, helping to increase that sense of stewardship in the community, is a good thing.